Nathaniel Marchant RA (1739–1816) was an English gem engraver. Marchant was born in Sussex in 1739. He studied under Edward Burch, and in 1766 became a member of the Incorporated Society of Artists. In 1773 he went to Rome, where he remained until 1789, when, having already gained a considerable at reputation for his engraved gems, he returned to London. He was noted as a sculptor of intaglios, medals, and poetical designs for cameos His subjects included copies from the antique, adaptations of famous paintings and portraits of his contemporaries. He held several appointments, including as assistant engraver to the mint, gem sculptor to the Prince of Wales, engraver to the king, and from 1800, engraver to the Stamp Office. He was elected an associate of the Royal Academy in 1791 and a full academician in 1809. When elected to the academy, Marchant originally offered a set of impressions of gems he had cut as his diploma work.They were however rejected on the grounds that they were not, as required by the Academy, " original work". He then sent a cast of a female head, which was also declined "casts not being deemed admissible from sculptors." He finally he submitted a gem which was accepted. In 1792 he published a catalogue of a hundred of his gems. ^ a b c d e Hodgson, J. E.; Eaton, Frederick A. (1905). The Royal Academy and its Members 1768-1830. London: John Murray. ^ a b c "Nathaniel Marchant (Biographical details)". British Museum. Retrieved 26 May 2016. A Catalogue of One Hundred Impressions from Gems, Engraved by Nathaniel Marchant. Internet Archive. "Portrait of Emma Hart, Later Lady Hamilton". Metropolitan Museum. John Flaxman was a British sculptor and draughtsman, and a leading figure in British and European Neoclassicism. Early in his career he worked as a modeller for Josiah Wedgwood's pottery. He spent several years in Rome, where he produced his first book illustrations. He was a prolific maker of funerary monuments. Sir Edwin Henry Landseer was an English painter and sculptor, well known for his paintings of animals – particularly horses, dogs, and stags. However, his best known works are the lion sculptures in Trafalgar Square. Prince Stanisław Poniatowski was a Polish nobleman, politician, diplomat, a member of the wealthy Poniatowski family and a nephew of the last king of Poland, Stanisław II Augustus. He was the official Commander of the Royal Foot Guards regiment directly responsible for the monarch's life as well as the Grand Treasurer of the Grand Duchy of Lithuania (1784–1791) and Governor of Stryj, which made him a key figure in Poland during the Age of Enlightenment. Nathaniel Wolff Wallich FRS FRSE was a surgeon and botanist of Danish origin who worked in India, initially in the Danish settlement near Calcutta and later for the Danish East India Company and the British East India Company. He was involved in the early development of the Calcutta Botanical Garden, describing many new plant species and developing a large herbarium collection which was distributed to collections in Europe. Several of the plants that he collected were named after him. Robert Smirke was an English painter and illustrator, specialising in small paintings showing subjects taken from literature. He was a member of the Royal Academy. 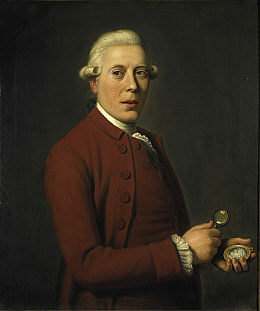 James Tassie (1735–1799) was a Scottish gem engraver and modeller. He is remembered for a particular style of miniature medallion heads, portraying the profiles of the rich and famous of Britain, and for making and selling large numbers of "Tassie casts" of engraved gems for collectors. Peter De Wint was an English landscape painter. A number of his pictures are in the National Gallery, the Victoria and Albert Museum and The Collection, Lincoln. He died in London. Samuel Cousins was an English mezzotint engraver. Henry Howard RA was an early 19th-century British portrait and history painter. An engraved gem, frequently referred to as an intaglio, is a small and usually semi-precious gemstone that has been carved, in the Western tradition normally with images or inscriptions only on one face. The engraving of gemstones was a major luxury art form in the Ancient world, and an important one in some later periods. Thomas Holloway was an English portrait painter and engraver. Adrien Carpentiers, also known as Carpentière or Charpentière was a portrait painter, possibly from the Low Countries, active in England from about 1739. Alexander Day was a miniature painter and art dealer. Born in Britain, he worked chiefly in Rome. James Ramsay (1789–1854) was an English portrait painter, working in oils. Johann Lorenz Natter (1705–1763) was a German gem-engraver and medallist.